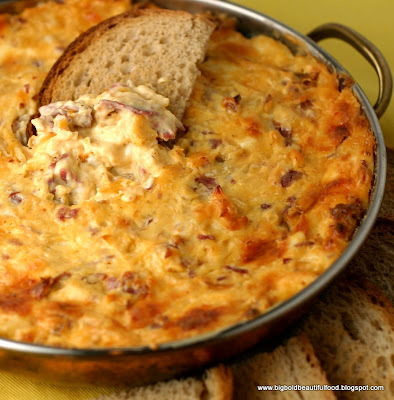 Sunday was Super Bowl Sunday, and I knew the perfect dish to make: Closet Cooking's Reuben Dip. 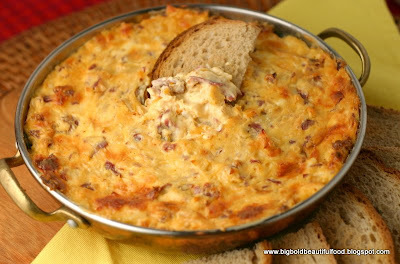 The dip was delicious, creamy and filled with corned beef, swiss cheese, and sauerkraut. A definite winner! I doubled Kevin's recipe, and good thing I did, because it was gone in the blink of an eye. 1. Mix everything in a large bowl. 2. Pour the mixture into a baking dish. 3. Bake in a preheated 350F oven until bubbling on the sides and golden brown on top, about 20 minutes. Ninette I made that too one day..The kids liked it! Great pic! It does look good and all the ingredients spell only deliciousness.!! Hi Ninette - I have to say - this looks sooo moreish. Something I wouldn't want to share with anyone. It makes sense to take an amazing sandwich and turn it into a dip---holy cow that looks good! Your dip looks amazing! This stuff is so addictive! Wow Ninette I have never had dip with corned beef in it. You know I'm in Sydney but I was excited about the superbowl. ehehehe. I think I'm a closet American. I remember seeing this on Closet Cooking. It looks rich and intense. Totally additive.